A-Ms Scripture Challenges and Faithbooking: His Holy Name Challenge at Faith Sisters. This was the first page I created for the first word we were given at the start of the year. This challenge is run fortnightly. 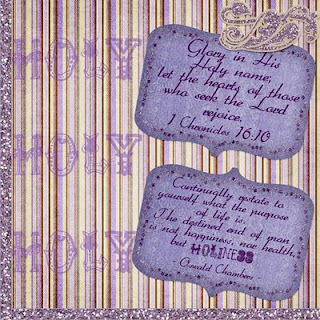 The word we were given was "Holy"
I used a digital kit by Digi Illusions available at Nuts 4 Digi.